I was just told about this application and felt like I have to write a quick post on it. Normally I wouldn’t focus on such a small plan but this is something else. 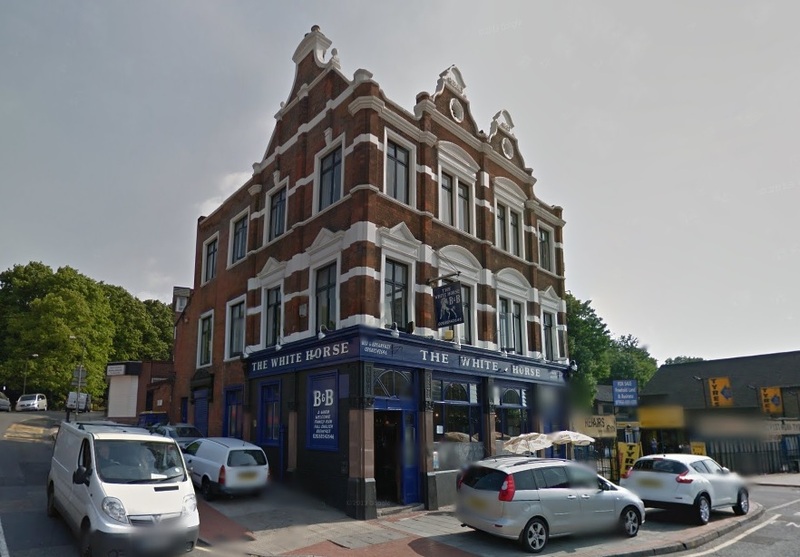 Plans have gone in to Greenwich Council to demolish an attractive Victorian pub building. It’s the highlight on a pretty grim stretch of road that should see some decent changes in coming years. Ignoring aesthetics (as hard as that is) this proposal would only have 9 flats and 8 car parking spaces. The existing three storey pub building is a fair size and looks as though it could accommodate a sizable number of units. The top two floors could be converted to residential with the pub remaining open. If the pub is not viable, and that is quite possible in that area, then an alternative use could be sought. If that is not possible then the ground floor could be converted. The current pub is on a stretch of road that has mainly industrial units, car parks and some poor examples of post-war housing. The current pub looks in good condition externally. It’s well maintained and the owners havn’t wrecked it. I can’t see any justification for its demolition, let alone what it is to be replaced with. Next to the pub is a temporary car wash. I initially thought this proposal was part of some bigger plan including that site which would have kinda made more sense, though it still wouldn’t justify its demolition. But no, it is demolishing just the pub, a good building in an area sorely lacking them, and replacing with a small number of units on the same small site. There seems to be a separate proposal for the car wash site. Having a scoot around on the aerial views on google maps shows what seem to be a lot of wasted land around there, which matches the impression you get when passing through. Some of the unused or under-utilised land could be used to build housing to help with the housing crises. Future housing that could use the pub or another community facility within it. There’s a derelict site a minute walk away by a roundabout. It’s overgrown with weeds and pretty sizable. 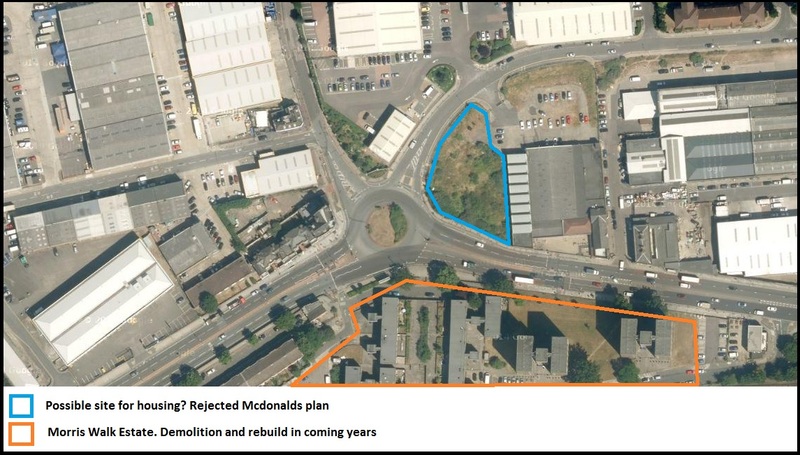 Mcdonald’s recently applied to build a drive through which was rejected. It seems a decent spot for new homes. When looking around that area on google I also saw the usual mess of street signage and ugly street furniture Greenwich Council excel at. Here is a barrier put in by the traffic light that seems to serve no purpose. There’s loads of the usual neglect and wasted money on unnecessary street clutter around there. Other sites nearby for possible redevelopment are sites like the single-storey storage place over the road from the pub, and various big car parks. The Charlton area masterplan came out recently and that can act as a trigger for changes. There is an intention to make the area where Woolwich meets Charlton near the river residential. The council could utilise the power it has to develop projects and also encourage private developers to take an interest in this area. The Morris Walk estate nearby is to be demolished and rebuilt which is good news. Alongside that the other wasted land can be developed but local assets like the White Horse pub need to be integrated within that. The proposed building is by far the ugliest looking one I have ever seen. My 2 year grandson could probably create something more aesthetically pleasing than that. I think it would be a dangerous distraction to any vehicle drivers passing by. Sadly residential over a pub wouldn’t work, the bank would not lend to potential buyers and that would diminish price and developer’s interest. Many pub buildings (and also banks and other historic buildings) have been converted into residential, including the ground floor. I see no reason why this building cannot be converted into residential from top to bottom. Feck me, I seem to have missed this post. Regretfully now I’ve found it I am going to have nightmares! Not just a ‘temporary’ car wash but a car tyre installer and a small car repair shop. The Charlton Riverside Masterplan appeared nearly two years ago and is fatally flawed. There has been no appraisal of the volume of employment that would be lost nor of the essential local goods and services that would go, including recycling, food distribution, City lift repairs and a critical supplier for British aerospace industries. I have actually checked – with the aid of excellent post grad students from UCL. Demolition of Morris Walk is good? For whom? Certainly not the 1,000 households currently living there. Forgive me for asking but do you check anything before writing/ It would appear not! Roy – you seem to get confused quite often it would appear. 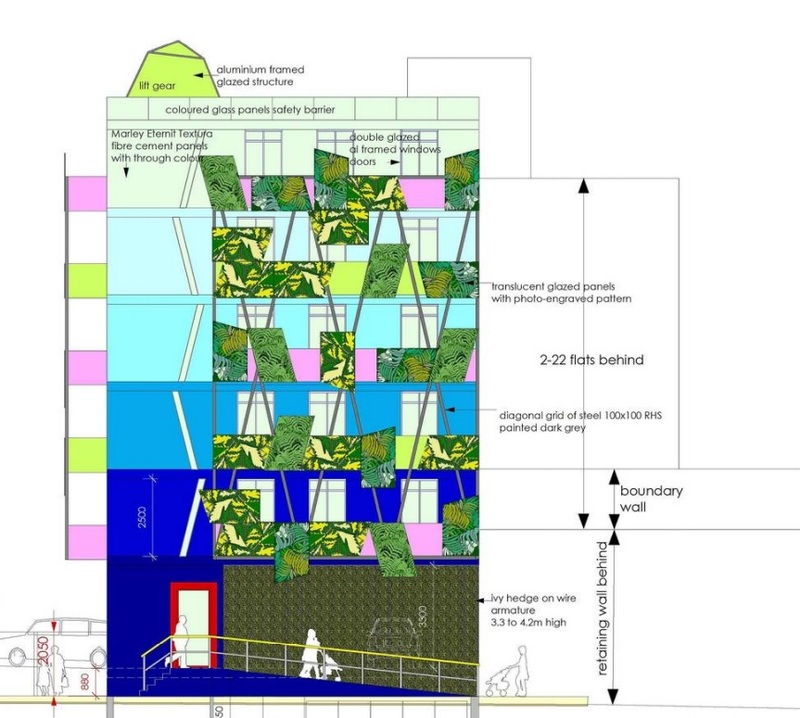 In your comments on 853 you got confused over who was writing comments, and also confused comments on the Woolwich Tesco building with the Woolwich Centre. You also seem relentlessy negative on almost any change or development. Morris Walk is in poor condition. Losing truly affordable homes is bad. Redeveloping a miserable place isn’t. Redeveloping with more affordable housing is what is needed. In the past you have complained about building high density homes in Woolwich near a railway station, DLR station, crossrail station, along with the commuter boat service, as it was bad for the environment. Maybe you have missed the large increase in population and that many people, particularly the young, cannot afford to rent or buy. Housing is needed, and building high density very close to public transport reduces reliance on cars to nil for many. It is far better for the environment than sprawl where everyone needs cars. Sure, there’s issues around lack of affordable homes to rent and buy within developments, but that doesn’t negate the benefits of high density. Actually, you are the one exhibiting confusion. You refer to me complaining about a commuter boat service, for example. Interesting! Several years ago, I worked with the Port of London Authority and London First to take members of the Board of TfL out on the River to promote passenger service development and the use of the Oyster Card. Borrowed the Hurricane Clipper, without charge, from the excellent Sean Collins. Perhaps I can explain some of the simple aspects of sustainability and why they do not support increasing densification? In fact I remember bringing up this topic, several years ago, at the annual conference of the Sustainable Development Research Network. I made reference to the developments in Riverside Wapping, the paucity of public open space and rising childhood obesity. Got a lot of support from health professionals, as I remember. You refer to reduced car use but don’t mention that according to research at Kings College, supported by work in the City of London, the primary cause of increasing air pollution lies with diesel engines, lorries, buses and taxis, not petrol engined cars. Petrol engines have become much more efficient, the diesel process, on the other hand, produces large amounts of NOx and carbon particulates. Thus, current public transport is part of the problem, not the solution. Then there is another of the ecosystems services, fresh potable water. The south east is an increasingly water scarce area. It often seems to be the opposite but winter rainfall is becoming more sudden, faster and heavier, so it runs off rather than percolating through to London’s aquifer. Most of London’s water, in any case, falls on the Chilterns and the South Downs: London is blanketed, below ground, with London clay which retains rainfall polluted simply by falling on London. English planning law, for absurd historical reasons, do not require a developer to state from where water will come, or where it will go. If we go on densifying we will run out of water and we will experience extreme problems with sewage treatment. Thames Water admit that the Tideway Tunnel is but a temporary solution. Then there are the growing problems of unsustainable drainage and the covering of land with impermeable buildings, roads and pavement. Flooding, thought of that? Crossrail will help local transport, at least, I hope that it will but it all depends on where one is going. The local road systems are badly congested and rail systems, too, are near capacity. There is no available cheap land to extend these so we really need more local employment. Oh dear, local masterplans aim the demolish local industry and to replace it with more homes. Where will all these people work and how will they get there? It’s all too easy to make simplistic comments about housing need but the problems are only resolved by careful thinking and by cooperation.